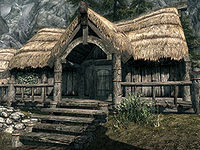 Horgeir's House is a residence in the northwestern part of Dragon Bridge, located next to Lylvieve Family's House and across from Four Shields Tavern. 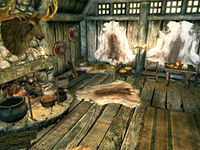 It is the home of Horgeir, his wife Olda, and his brother Lodvar. It consists of one zone, Horgeir's House. The front door to this small home opens to a view of the fireplace at the center, with a cooking pot at its base and an Imperial sword on the mantel. On the floor to the right of the fireplace is a woven basket containing four red apples and five green apples, while four pieces of firewood sit in a pile to the left. On the east side of the home is a small bedroom area, with a single bed in the northeast corner. A lute can be found propped against the wall next to the head and two drums sit at the foot of the bed. Beneath the bed is a copy of the book Spirit of Nirn. In the southeast corner, a small table holds a flute, two boiled creme treats, three bottles of Nord mead, and a sweet roll. On the opposite side of the home, another bedroom area can be found in the northwest corner, with a double bed along the north wall. 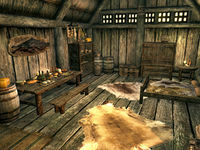 Next to the bed, a small table holding two bottles of Black-Briar Mead sits in the corner. A non-respawning wardrobe is situated next to the table, with a small non-respawning chest to its left. The south wall on the west side of the home is host to a cozy dining area. A respawning food barrel rests next to the front door with some sliced goat cheese on top, next to a large dining table with a pleasant array of food: an eidar cheese wheel, a garlic bulb, three loaves of bread, one salt pile, a bottle of wine, two bottles of alto wine, two chicken's eggs, a serving of baked potatoes, a sweet roll, an apple pie, a serving of grilled leeks, and two bottles of Nord mead. To the right of the table sits a woven basket containing two leeks, with a hanging rack above it holding three freshly caught rabbits. A set of shelves next to the basket holds an additional two leeks, a garlic bulb, and three potatoes, along with an eidar cheese wedge, some sliced eidar cheese, and a goat cheese wheel on top. Above the shelves are several hanging ingredients, including two garlic braids, three portions of dried elves ear, and one dried frost mirriam. A respawning meat barrel and respawning food barrel sit in the corner next to the shelves. The front door has a novice lock, the key to which is carried by Horgeir, Lodvar, and Olda. This page was last modified on 5 September 2014, at 04:19.